Tangles and Plaques COVER ART!!! What a journey this is—working with four publishers at various stages for four different books being published in 2017 and 2018. I’m so thankful for these opportunities, and I’m learning a lot about the business as I continue in the editing phase for some and enter the pre-publishing and marketing phase for others. 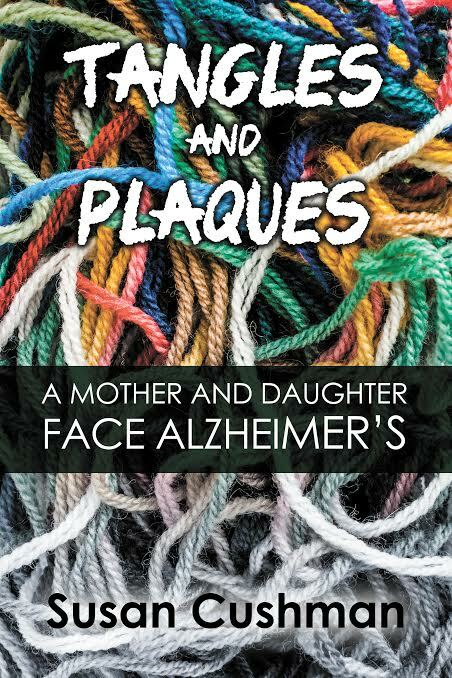 Today I received cover art from eLectio Publishing for Tangles and Plaques: A Mother and Daughter Face Alzheimer’s. I love the way the tangled yarn fades from bright colors to almost black and white below the title line… just as memories fade for those suffering this disease. Good job, eLectio! I appreciate each person involved in this complex process—editors, publishers, graphic designers, and marketing professionals. Although I chose not to work with literary agents (after an unsatisfactory experience) I’m learning my way without them. What that means is that I’m giving up on book deals from the big houses, like Penguin Random House, Harper and Collins, and Simon and Schuster (and big money) but what I’m gaining is more control, and more personal involvement in the process. So, if an agent sees one of my books and wants to take me on, I’ll listen to her pitch. But for now, I’m a happy camper. Watch for more news about Tangles and Plaques in February.